At this point in 2009, I think most people probably have a general grasp of influenza virus infection patterns. At the simplest level, a few strains of virus circulate every year, with relatively small changes year-to-year. Every so often, a new strain, with larger changes, appears and spreads globally, often becoming the dominant “base” strain for a while (that is, circulating annually with smallish changes each year) until it in turn is replaced by a new strain. 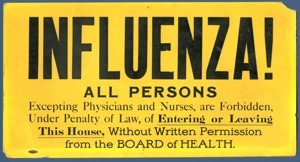 It was quickly discovered that the “new” H1N1 was not new at all. Even without modern genomic sequencing systems, Peter Palese’s group was able to show that the 1977 H1N1 was actually an old strain,2 described in 1950, that had re-appeared without any evidence of evolution throughout the dozen intervening years. Although Palese didn’t outright say it at the time, this almost certainly was a laboratory strain of influenza that had escaped back into the wild. A couple of side notes before I continue. There are several other claims in the literature that various influenzas since 1977 are lab escapees. Most, if not all, of those claims are almost certainly wrong, and represent a different kind of lab contamination — reference strains of influenza that have contaminated the test strain, within the lab, rather than a lab strain actually circulating in the wild. 3 This form of lab contamination with reference strains seems to be a relatively common source of error,4 and it’s certainly a problem, but isn’t an actual direct threat to the population. In particular, the swine-origin H1N1 is not a lab escapee (and, in spite of the rumors among bloggers who don’t know anything about viruses, but who dearly love a conspiracy theory, it’s not an artificial construct). Although the details of the SOIV origins are fuzzy, its parents and family tree is pretty clear by now. That said, lab escapes are not unheard of. Notoriously, the last case of smallpox was a lab escape, and the 2007 outbreak of foot and mouth disease in the UK was almost certainly an escaped lab strain from the Pirbright Research Center. 5 The problem with the conspiracy theories6 isn’t that virologists say lab escape is impossible. We know perfectly well that lab escapes can, and do, happen. The reason the conspiracy theories are wrong is that escapes have happened and been promptly detected and reported. There’s no conspiracy. I’d like to see this work repeated by an independent lab to make sure it’s not lab contamination (and the authors clearly want the same thing: “Therefore, more studies are needed to confirm the origin of American genotype V viruses”) but it certainly seems like a plausible explanation. I’m not a Dengue expert by any means, but I don’t think there’s anything especially hazardous about the “new” (old) strain — Dengue is already widely present in these areas, and I don’t think having one more strain in circulation adds to the general population risk. But I’d like to see an expert’s opinion on this; interactions between Dengue strains are important in the disease. In any case, it reinforces (if reinforcement was necessary) the importance of proper lab procedures and security. 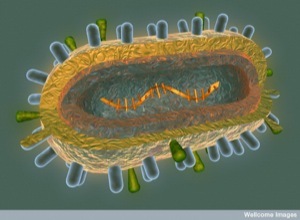 Recent human influenza A (H1N1) viruses are closely related genetically to strains isolated in 1950. Nakajima K, Desselberger U, Palese P.
On the danger of reintroduction of an old, unstable strain: dengue hemorrhagic fever. Introducing an old strain that is sufficiently different from presently circulating, locally adapted DENV just might suddenly goose exposure rates. Under the right climate conditions, it means a sudden surge in deadly DHF among susceptible induhviduals (prior exposure to other strains, female, < 12-yo, Caucasian are important factors), as DHF has a decidedly depressing mortality rate. 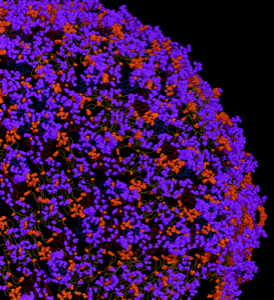 The newly identified DENV-3 genotype (V) was isolated from a DHF victim. Further, the virus is unstable. It's going to mutate.